SCR (silicon controlled rectifier) switching is used to control peak currents of thousands of amps mostly to make big bangs but also to drive projectile devices such as a rail gun and coil gun. Power is 1500 Joules at 4700 uF 800 V from 4 electrolytic capacitors rated at 4700uf 400V each. The heavy duty SCR was one of 3 still functioning that I obtained from a 3 phase 400 A controller I got from a scrap yard for A$50. I have blown one of them into a very low impedance unloaded coilgun. They come with a solid heat sink and heavy gauge leads. The heat sink is not needed for this application since there is little transfer of heat with these single pulses of typically a few tens of milliseconds, however I don't have the tools to remove them. The 4 capacitors are 4700 uF 400 V. The charging transformer from an ancient TV is bottom left with voltage doubler and relay. The SCR drive electronics and protection diodes are upper centre. The drive electronics come from Sam Barros' site in Links which is an excellent source of HV information. It all fits with a bit of a squeeze in a lockable glass fronted aluminium case. 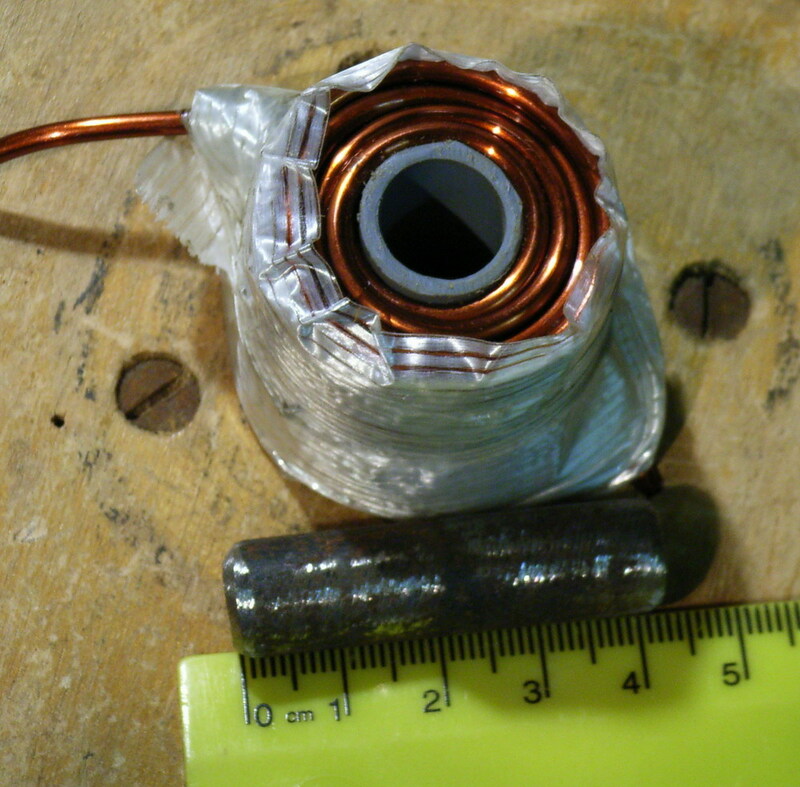 The left photo shows the capacitor bank connected to heavy copper bus bars with 1 x 4 inch aluminium foil across them. .The right photo shows the flash when fired. Note that part of this flash is the 1500 joules and part is due to ignition of the aluminium as there is very little of it left. Aluminium is explosive when powdered and is used for flash/bang or stun grenades. Check this out for a really serious capacitor bank ( 60 MJ ). A rail gun is a method of converting electrical power into kinetic energy of a metal projectile. The fastest projectiles known used magnetic propulsion to achieve speeds of many km/s (record of 12 miles/s (20 km/s) by Sandia Labs) and efficiencies up to 30%. The principle is simple - pump 1,000,000 amps or so down 2 parallel conductors joined by the movable conductive projectile. Lorenz magnetic forces down the 1 wire 'coil' push the projectile forward. The power of the basic setup (above) is really is a bit low for a railgun due to startup friction and I was rather surprised that it worked at all. 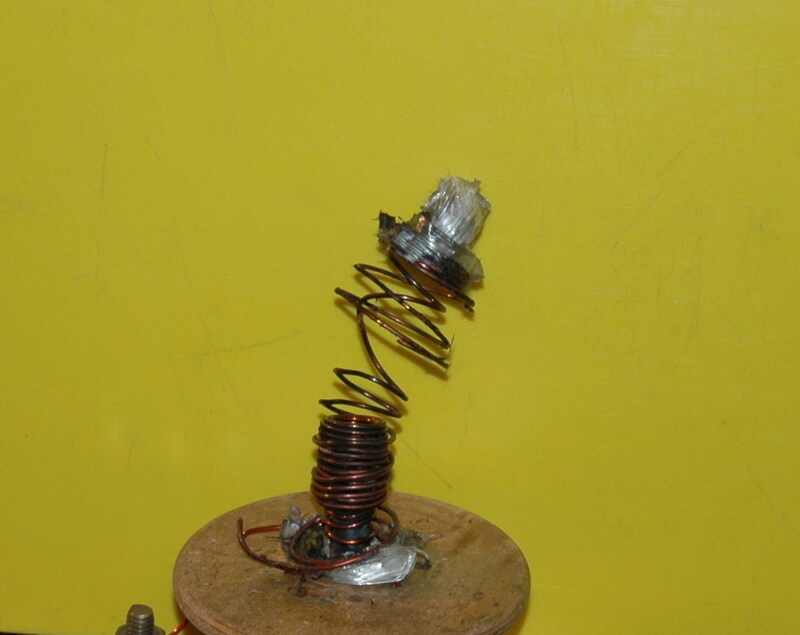 Adding a magnetic field helps using magnets from a magnetron out of a microwave oven. I have a couple of more powerful 1 inch (2.5 cm) Neodymium Iron Boron N40 grade magnets which will be interesting to try in this setup. This is run in series with the unloaded coilgun coil to limit peak current. At best a thin springy copper wire traveling along the center of the copper bars will penetrate paper at 3 feet with a big flash and bang. Not really rocket science yet. I have now completed a larger railgun. This uses a pressurized air injector system with a fast opening 230 V 7 W solenoid operated high pressure valve (16 bar) and is connected to a 24 x 4 inch heavy PVC 'tank'. This has been tested to a pressure of 8 bar = 120 psi (pounds per square inch) and seems to hold its pressure well. It is constructed from schedule 12 (12 bar) pipe and schedule 18 (18 bar) fittings so should be within tolerance. The weak spot where the compressor valve enters is reinforced internally. I have used P type PVC glue with methylethyl ketone primer for a higher pressure rating. It gives a satisfying blast of air when activated. The rails are constructed from brass bar and teflon strips of about 18 inches. The first 4 inches or so has polycarbonate insulator for the rails to allow the air to give it some velocity before being electrically accelerated. The left photo shows the air injector system with compressor and the right photo shows the rail internals. The left photo shows the completed railgun and the right photo shows the projectile after a few firings (ruler in inches). 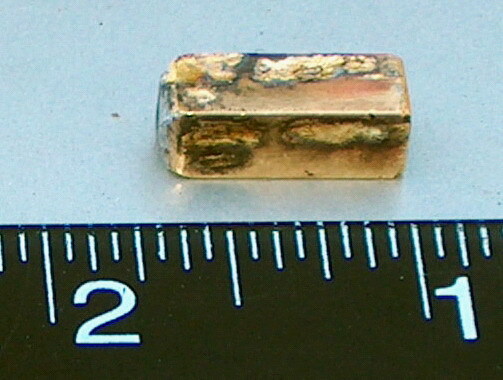 The projectile is brass square tube filled with solder (probably has as much lead as a small bullet). It will drop through the railgun if vertical. It is breech loaded through a T piece. After firing it is hot but still able to be touched. At present it fires although how much is due to the air pressure alone is unclear. I have been shooting into a soft target (so I can recover my projectile). To measure velocities, I need to set up the ballistic pendulum and work out the maths to get results with and without the power applied. Unlike the coilgun, care needs to be taken that the pendulum is not just being blown by the flow of air from the muzzle which means it has to be a longer distance away and be set up outside my shed. Velocity measurement is a problem particularly as optical devices can get falsely triggered by the muzzle flash. Since I finished it I have now got graphite powder as a lubricant and also a storage oscilloscope which should enable me to measure peak currents and record them. I also have a couple of hockey puck SCR's rated at 1700 A as potential replacements so I can push my present SCR harder and not worry if I blow it. An amusing incidental use for this air injector is for a 'spud gun' or 'potato cannon'. 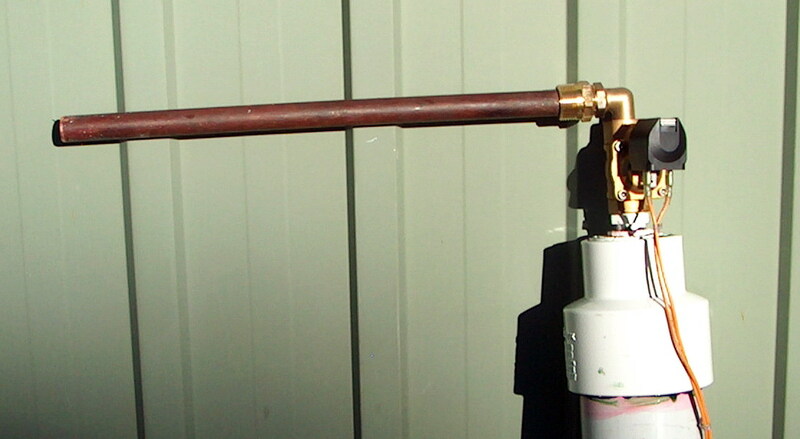 Jam the end of a 15 mm copper pipe into a potato then push the plug of potato down to the pressure end and 'fire'. At 40 psi the potato is shot out the end fast. It still seemed to be travelling horizontally after 30 yards or so as it disappeared into the trees. When aimed vertically, flight time was 5 seconds. I will have to get out the ballistic pendulum to check the velocity. Other people have elevated spud guns to an art form. Recently, I needed a length of copper pipe to make a high current coaxial resistor so I removed about half the barrel length. This means that I now have a sawn-off spudgun! 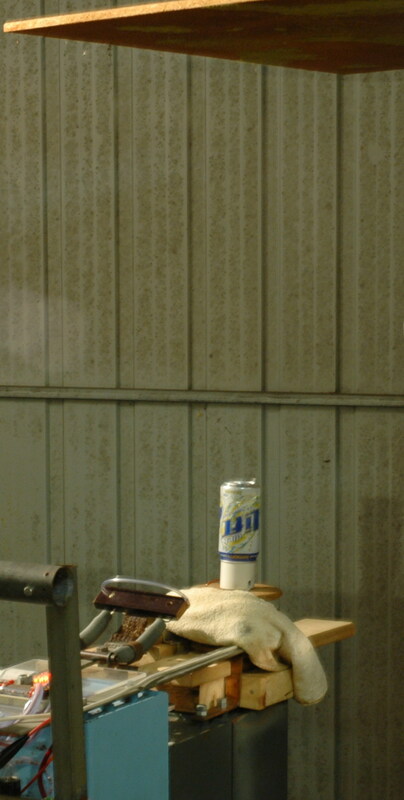 This coilgun shown aiming into a ballistic pendulum with a can as the target. The power is sufficient to go through the can. The centre barrel is a brass tube with longitudinal split to prevent eddy currents. Care is needed as this can shoot backwards with the wrong combination of projectile size and starting position. I was getting 60 feet/s (20 m/s) calculated from 4.3 sec flight vertically. Compare this with a handgun at 600 feet/s (200 m/s) and it is not really a 'gun'. This is a simple single stage gun. In contrast to the railgun it is almost silent in operation. This is the world arsenal of proper hand held coil guns. I have used my big capacitor bank to drive a coil gun at higher levels. This shows a 46 turn coil about 4 cm diameter and about 5 cm long. 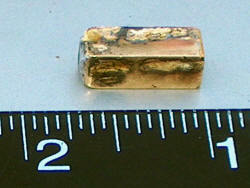 The iron rod projectile is just over 4 cm and weighs 33 g. I tried various energies from 500 J to 3 kJ in sequence. Here is the last shot sequence. 2 kJ gave the most powerful shot and good deformation but not penetration of the can. The left photo above shows the coil mounted vertically and covered by some PVC. A can lies on top. The right photo shows the firing at 3 kJ. It shows the can streaking upward, hitting the top board and ricocheting backwards which is the faint streak extending down from the upper board in the 1.3 second exposure. This was not due to the projectile which didn't leave the barrel and was just due to the explosive force from the coil disruption. The result of 3 kJ on the coil. The forces on the coil are axial compression and radial expansion leading to coil disruption and inter turn shorting. Handpowered coilgun 2004 My original coilgun is a bit unique being portable and driven by a hand powered generator from an old telephone handset in the original box . This charged a 5400 uF 225 V capacitor to a total of 136 joules. I also had a power pack for times when the arms get sore as it takes a couple of minutes of vigorous winding to charge. Not really fast on the draw. Switching was with two metal contacts. It could just penetrate a cardboard box with an 8 g iron rod. My big cap bank can drive 100 kA into a railgun but this would require a significant upgrade and would need a chronometer to measure velocities. 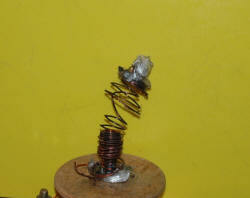 An inductor might be needed to slow the rate of current rise or I could rely on a plasma armature effect. I have acquired 6 heavy duty SCR's from old x-ray gear as well as 6 capacitors. 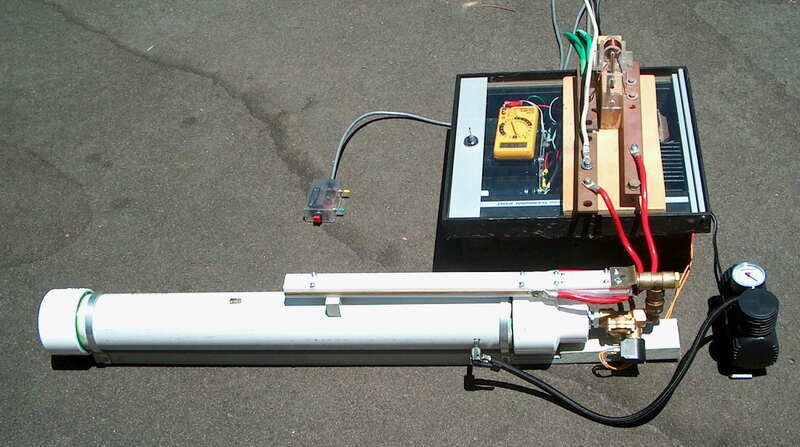 A multistage coilgun is looking feasible.